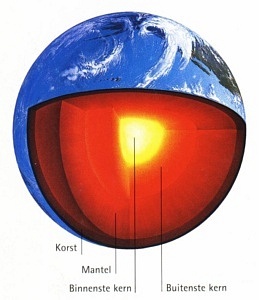 The cause of the high temperature of the inner core of the earth is currently thought to be radioactive decay and residual heat. This article provides a different explanation: Energy conservation. Imagine a tunnel through the earth and calculate the potential energy of a molecule at the surface and in the core. You will be surprised. The potential energy is calculated with help of Einstein’s ‘Gravitational potential’. The authors abide Noether’s conservation law (the sum of energy remains constant) and proudly use their repaired Schwarzschild solution. The conclusion must be that the melting earth’s core is caused by gravitation. The fusion in the sun-core is caused by gravitation. Not the other way around as many scientists think.